The Ultramarines are a byword for loyalty and courage, their martial prowess is legendary and is second only to the God-Emperor. 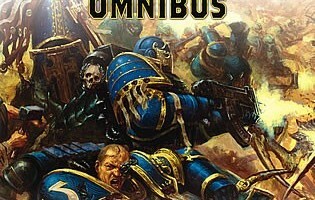 Graham McNeill¹s epic trilogy of Ultramarines novels is a masterpiece of non-stop action! 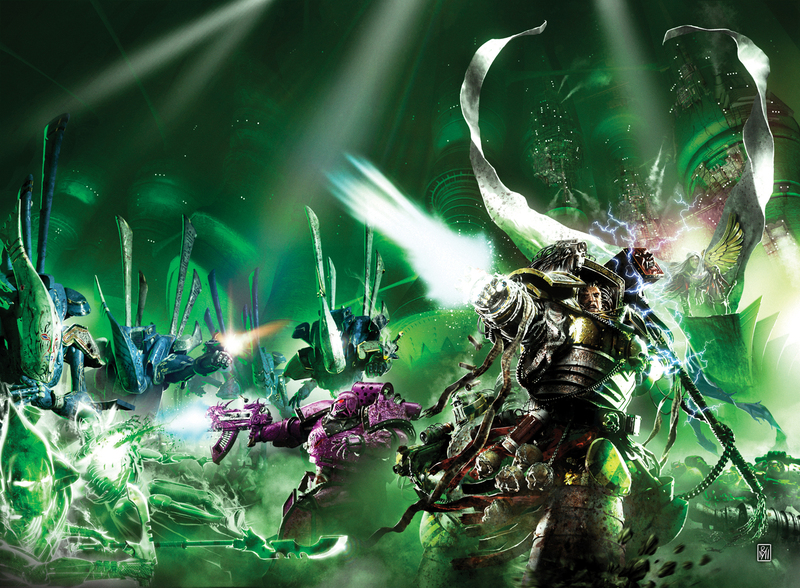 Containing the novels Nightbringer, Warriors of Ultramar and Dead Sky, Black Sun, plus a connected short story, the series follows the adventures of Space Marine Captain Uriel Ventris and the Ultramarines as they battle against the enemies of mankind. From their home world of Macragge, into the dreaded Eye of Terror and beyond, Graham McNeill¹s prose rattles like gunfire and brings the Space Marines to life like never before. From the moment I read about the Legiones Astartes in Rogue Trader, I was hooked, their nobility coupled with their utter lethality struck a chord in me that’s resonating to this day. So, of course, they were the first army I collected – though, confusingly, my Dark Angels were painted orange for reasons that escape me now – and Space Marines were the army I used in the Return to Vogen campaign we played in the Design Studio (4th Company Ultramarines, obviously…). So what is it that makes Space Marines so popular? Is it their models, their art, their rules, their background? Actually, it’s all of the above, but for me it was the background of these heroic warrior knights that hooked me in first. The fact that, unlike the faceless soldiers of the Imperial Guard (pre Dan Abnett’s Ghosts), each individual warrior was a hero, with his own tale of valour and his own legends was just the coolest thing ever. The fact that such warrior brotherhoods willingly gave up any chance of a ‘normal’ life and dedicated the rest of their existence to the service of the Emperor and Mankind really ennobled them and made their sacrifices so much more heroic. Working for Games Workshop allowed me to write about Space Marines pretty regularly, which was nice, but my real chance to have fun with them came when I wrote a short story called ‘Chains of Command’, introducing a veteran sergeant by the name of Uriel Ventris. When I wrote that story, way back in the dim and distant time of February 2001, I had no real plan to take the story or character further, except maybe another short story if the Black Library liked it. So when I met the BL’s Christian Dunn in Bugman’s for a coffee one afternoon and he asked me whether I’d like to write a Space Marine novel for them, it took less than a nano-second for me to say yes. The one proviso was that it be a Codex Chapter, since Bill King’s Space Wolf novels were already in print and very popular. Again, it was a matter of seconds before I said that it would be the Ultramarines. I decided I wanted to write about the XIII Chapter because I think, at the time, they had a bit of a bad press about being boring simply because they didn’t have uber-killy rules and weren’t vampires or barbarians in space. I knew differently, and set about changing this deeply flawed perception. Anyone that’s read the background of the Ultramarines in 2nd Ed Codex and the splendidly written Index Astartes article in White Dwarf should know that the Ultramarines have it all, a murdered father, civil war and a son’s revenge. If that ain’t classic then I don’t know what is. So when I began to write about the Ultramarines in my first novel, Nightbringer, it was with this epic sweep of history behind them, which informed as much of the story as anything I came up with. As a first book, I wanted Uriel’s journey to follow the same voyage of discovery I was on. He was learning to assume command of a Space Marine Company and I was learning how to write a novel…neither of which is an easy task, I can tell you (though I’ve never tried leading a Space Marine Company!). Originally, I only envisaged one main character, but once I saw the cover of Nightbringer, and the flamer-toting Space Marine, I knew he just had to be part of the story. Thus was born \ Sergeant Pasanius, who rapidly became one of my favourite characters to write. It’s been said that you can’t write for Space Marines, because they’re not human and are faceless warrior automatons, but that’s just not true. Yes, they have been psychologically modified, but this just makes it more of a challenge to do well, and what you need to remember is that the Space Marines are willing participants in all this. They are not being indoctrinated as this implies a surrendering of responsibility and I think it’s much more heroic and interesting to portray the Astartes making deliberate, daily decisions to choose to undergo the rigours of being a Space Marine. This is an aspect of Space Marines I wanted to investigate in Warriors of Ultramar, where Uriel was placed side by side with soldiers that, had he not become an Ultramarine, he could have been just like. Shown the life he could have had, would Uriel regret the decision he made to become one of the Emperor’s finest? Some people then argue that it’s hard to write Space Marines because they think that they don’t experience the full gamut of human emotions. I disagree, and in Dead Sky, Black Sun, I explored this facet of Space Marines and threw Uriel and Pasanius into situations and meetings with other characters where it would be impossible for them not to have some emotional reaction. At the end of the day, Space Marines are human, albeit horrifically altered, and they can experience all normal human emotions including pride, anger, jealousy, desire, joy, hatred, affection and so on. They are however able to suppress their emotions using the conditioning and training they have received, but that doesn’t mean they don’t feel them.